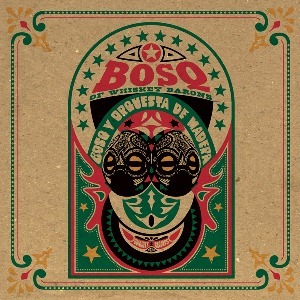 Bosq Y Orquesta De Madera is the much anticipated full-length debut album by Bosq from Whiskey Barons. On the heels of his three well-received 12” singles, the album delivers on the promise of a well-rounded and killer collection of Afro, House, Latin, Soul and Disco tracks with the intention of keeping bodies moving on the dancefloor. As the name of the album suggests and it’s literal translation to “Bosq and the Wooden Orchestra” Bosq aka Ben Woods has played as many parts as possible himself (piano, organ, rhodes, percussion, drum sequencing, synth & bass work, etc) and brought in a wide range of experienced session musicians where needed, including guest vocalists on most every track and in essence creating a “makeshift orchestra” to suit his musical needs. Benin born & Nigerian raised singer, producer & guitarist Kaleta appears on three tracks that can also be found on the singles, while Mendee Ichikawa (Free Moral Agents) lends her vocal talents to two gritty soul numbers. Brazilian chanteuse Tita Lima appears on the Tropicalia-infused “Paciencia De Jo”, while Soundsci MC U-George, gets down and does a little bit of “toastin” on the rugged Dub and Reggae tinged “Wuk Up”. Jesus Pagan on “Pura Candela” which seems like a long lost Salsa single from Fania round out the musical cast. Ben finishes up his musical tour de force with a couple of classic instrumental House tracks with some modern flavor.